mix all the ingredients with a little water and make a mixture which can be shaped into balls. 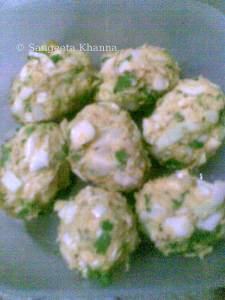 make balls and arrange on a greased microwave safe dish with lid. for 5-6 such balls, microwave for 3 minutes , meanwhile, keep the oil redy to fry and put in the balls as soon as it comes out of the microwave, which looks like this, interestingly it can be eaten as it is with chutny.when we fry the balls as soon as it comes out of the microwave, as it is already very hot, it takes less time to become brown n crisp on the outer side....the inside has been already cooked in the microwave.........take out the balls just after a minute and serve hot. grind together 1 cup of green coriander with all the stalk, and ginger, green chillies and a few garlic cloves......mix salt and lemon juice and it is ready to serve. 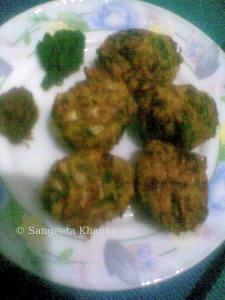 i keep amla preserved in 15% salt which i use to make this chutny in the picture. grind equal quantities of preserved amla, garlic and whole red chillies to make a fine paste n it is ready. i had guests over today and made 3 items all from your blog....one was this cabbage fritters which was a last moment decision after i came to know that they were stuck in traffic..other than this i made dhokla (following your process to the T and i was successful in my 3rd attempt..my 2nd attempt was a GITS one...but after tasting this one today i will never go to GITS option:) ) and pasta my version plus yours combined :) . What I do extra with my pasta is: 1) I add one big onion in the beginning cut lengthwise (long ones). 2) readymade tomato and basil pasta sauce (I dont get good khatta tomatoes here and add this for gravy plus tanginess) 3) few canned black olives (because i just love them) and vinegar. so here are my crazy ideas.....i have to give you credit your recipes are really quick :) thanks for this blog !! Not only for trying the recipe but for the wonderful feedback too ...this is what keeps me going here.